your looking at this is an excellent find. with some age loss on the fase. 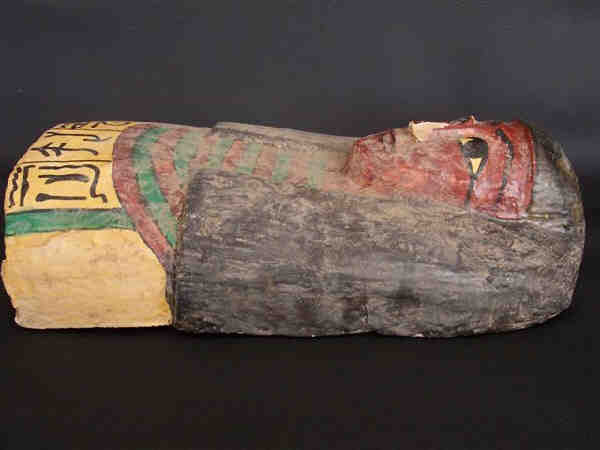 wooden coffin lid or panel. 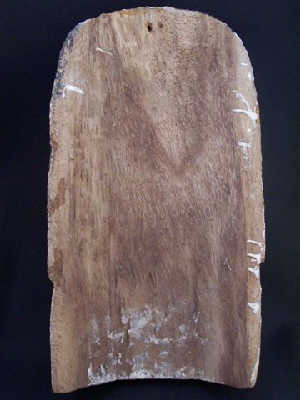 This is merely a fragment of depicting the face. This ancient Gentleman wears a black wig, and has a brown complexion with large almond shaped eyes. 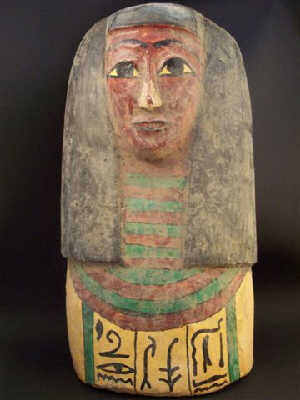 There are hieroglyphics painted on the bottom in black pigments. The panel has been carved from wood, with a guesso overlay then painted with brilliant lifelike colors. This is a terrific item. Would be a great item to put on display!. Dont miss out! Place your bids now!. I obtain my items from various sources (antique dealers some of those dealers have been working in this business since 1930's and 1940's) private collections and or estates), We have received all information regarding our items from second hand sources, and the timeline set on our items is to be used as a guideline for the above period listed. Since I am a collector myself I tend to take pride in the items I aquire. These pieces are wonderful and we present them as they have been represented to us . why private auction ?! We value our customers and their individual privacy as well. Therefore we choose to keep our auctions and feedback profile private. This not only protects our customer list from unethical or predatorial sellers but also prevents unethical vultures from preying on our customers with out of Ebay sales which is risky and against Ebay policy and user agreements.